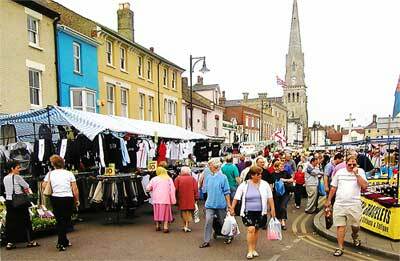 Market Hill is full of market stalls every Monday morning and there's a smaller market on Fridays. The really big market, seen above, is held on Bank Holidays. 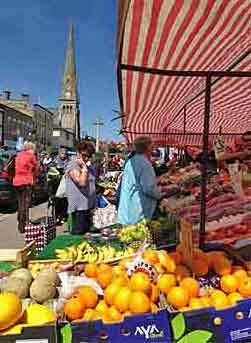 The Free Church (in the background) has a popular inexpensive snack bar much used on on market days! 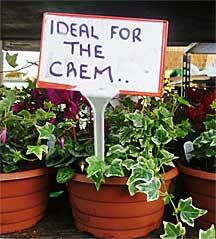 There's a good choice of plant stalls ... with something for everyone. 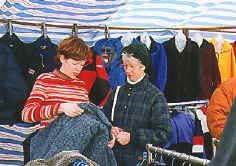 The same stalls return every week, and can offer good value for money. 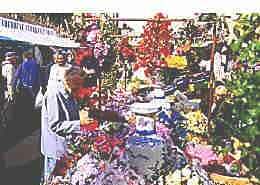 This market fish stall was here for many years on Mondays, Fridays and Saturdays. 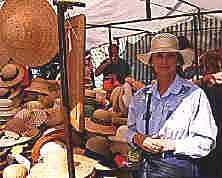 It has since been replaced by different suppliers who only come on market day. 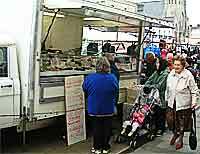 The fruit and veg stalls attract many customers to the Monday morning markets. That's the Free Church in the left background. Where the market began. Looking down the Broadway towards the centre of town.The buildings in the middle (the ugliest in St Ives?) separate Crown Street (on the left) from Merryland (on the right). 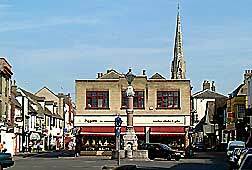 These buildings were built on the site of the original market stalls that used to be set up in the centre of what was once a very wide road. The monument celebrates Queen Victoria's Diamond Jubilee in 1897, although it wasn't actually erected until 1902. A Fenstanton brewer had seen something similar at Sandown while on a holiday in the Isle of Wight and been inspired to commission it! It originally served as a drinking fountain.